When you have narrowed down the application you will use your hoist and crane for, it is important to understand and anticipate the components that take the toughest beating. Naturally, when it comes to lifting, you will always have friction points and more often than not, those friction points are the points where your crane & hoist components are most likely to fail. Best practice would be to identify those spots as soon as your equipment is installed and set-up regular inspections that specifically outline those points of concern. For example, this picture shows a the top hook of a hoist (hook mounted) attached to the trolley suspension lug. The suspension lug is a heavy load bearing steel plate with two holes. The top hole attached to the trolley via the trolley lug pin. The bottom hole is where the top hook of the hoist (suspension hook) is attached. As you can see in the picture, the lug hole is heavily worn from the weight of the hoist and loads wearing on it. It is time to change this one. 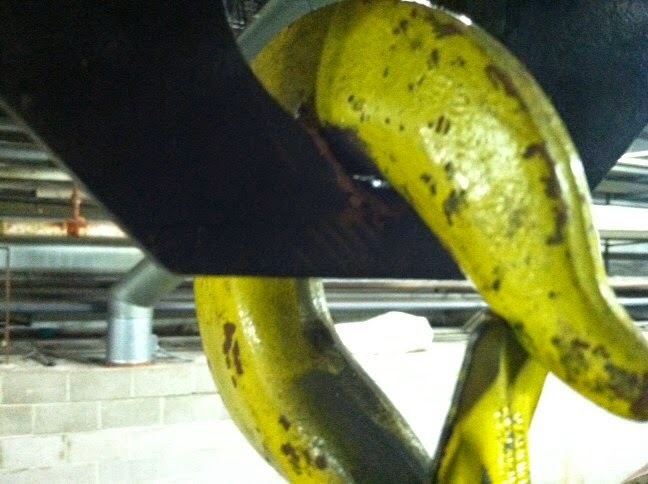 These type of wear could prove to be dangerous if not address as you can imagine the steel could fail, snap, and the hoist and load can plummet to the floor or worse.